What better way to celebrate a holiday, birthday, anniversary or special event than giving a railfan and loved one a RailsNW Gift Certificate, which can be used to book a trip to the Canadian Rockies, the Grand Canyon or any one of our popular destinations! Come join us this year on one of our many exciting trips or tours; whether it be an unforgettable trip to the Grand Canyon, or a thrilling adventure through the mighty Copper Canyon region of Mexico. 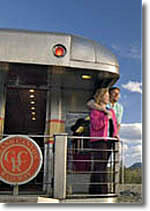 Please call or email us today to secure all your rail reservations for this year and beyond.